With an album on the horizon, the buzz is coming back in full force for ¡MAYDAY! 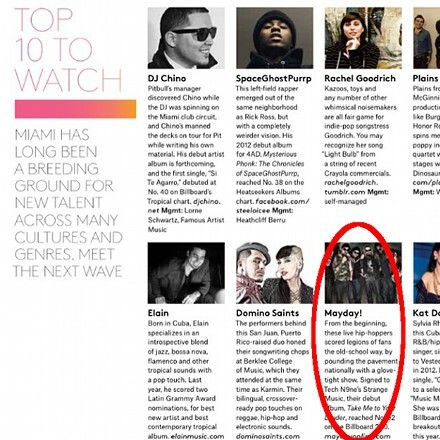 In a recent issue of Billboard Magazine, the Miami group was cited as the new wave of many artists from Miami to pay attention to. From the beginning, these live hip-hoppers scored legions of fans the old-school way, by pounding the pavement nationally with a glove-tight show. Signed to Tech N9ne’s label Strange Music, their debut album Take Me To Your Leader reached No. 92 on the Billboard 200. What’s your favorite song from Take Me To Your Leader?